Justice for Children and Youth strives to protect and advance the legal rights and dignity of children and youth. 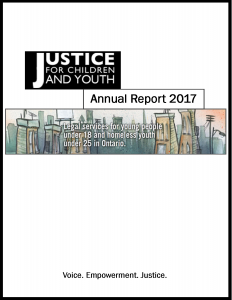 Justice for Children and Youth is the operating name of the Canadian Foundation for Children, Youth & the Law, Inc. The Foundation is an Ontario non-share capital corporation with charitable status. It is administered by a volunteer Board of Directors who are elected at our Annual General meeting usually held in October. The corporation itself is made up of members who pay a yearly fee or one life-time membership fee. 35 Years at JFCY (1978 – 2013) – JFCY was formally incorporated as the Canadian Foundation for Children Youth and the Law in 1978; and was known as Justice for Children (JFC) until 1990, when the foundation became formally known as Justice for Children and Youth (JFCY). In 2013, JFCY celebrated it’s 35th anniversary and created this document to highlight some of the foundation’s achievements through the years.